Apparently Linus, who now goes by the name Brady, doesn't miss his friends at the shelter as much as we all miss him. 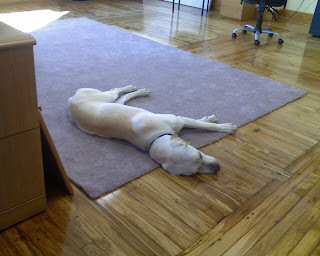 We received this cute photo of him relaxing in his new dad's office on his first day (he moved in last night) at home. He was never this relaxed at the shelter. Lucky dog! And as his new family already knows, they are lucky to have such a nice pup.